In our last blog post, we touched on a few of the factors that are taken into consideration when a judge sets a bail amount. Each point that we mentioned, however, also brought up the fact that a judge has the chance to deny bail entirely. A complete denial of bail isn’t something that will happen to every case that a judge reviews. In fact, this is another scenario where there are multiple things that will need to be considered by the judge before they make their final decision. Today we are going to cover some of the most common reasons that a judge will deny bail when looking at the charges of an arrestee. Let’s get started. One of the primary reasons that a judge will deny bail is because the charges in question are for a felony charge. Felony charges will always have something to do with sexual assault, espionage, violence or murder. Given that these are such extreme cases, it’s not uncommon for judges to raise the bail to an extremely high amount that is unlikely to be met by the arrestee or deny bail entirely. If there is any chance that the individual that has been charged will be given the death sentence or that they have a strong case built against them, it is even more likely that the arrestee will wind up with a complete denial of bail. Another reason that a judge could deny you bail is if the defendant has some history with missing court dates or is a flight risk based on the sentencing that is likely to happen. If there is any evidence or background that shows that releasing the arrestee from jail could lead to them fleeing, then there’s a good chance that bail will be denied. While we’re talking about factors considered with flight risk, it’s good to note that physical fleeing isn’t the only thing that the judge will be looking at. If the defendant has ever skipped out on paying a previous bail, the judge can also deny bail because of flight risk. Having a criminal history doesn’t help much when it comes to a judge determining whether or not they should set a bail. 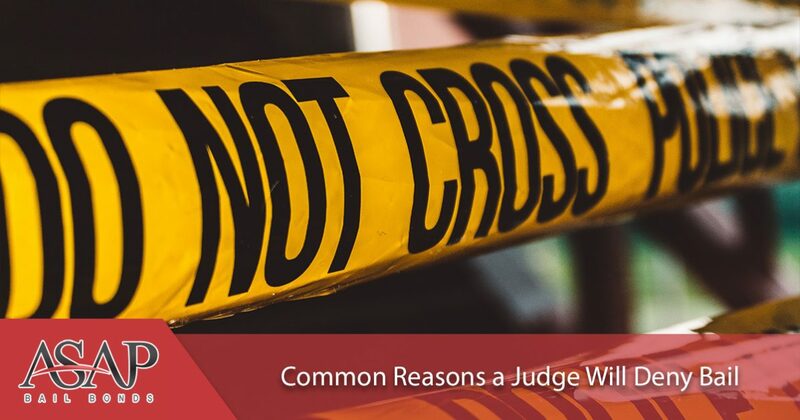 Whether the defendant is on probation, has a prior offense, has similar charges, or has been charged for more serious offenses, it’s very uncommon for judges to show sympathy for individuals who have a prior criminal history. When a judge sees these types of cases, to them it shows that the defendant is not serious about making changes and can not be held responsible, so bail is denied until they’re able to attend court and determine how they will proceed. When an individual has committed a crime or has violent charges against them, the last thing that the judge wants is to put them in a position where they could potentially harm someone. The safety and well-being of any individuals that were involved in the crime and society as a whole are something that the judge needs to take into consideration before they post bail. 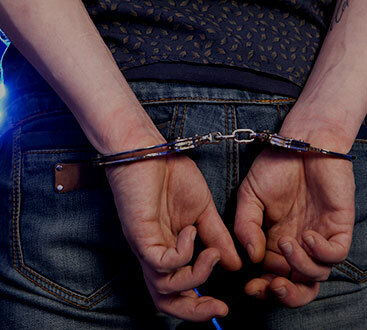 This point ties into why individuals with felony charges are unlikely to be granted bail — those are violent crimes and could lead to an individual being hurt. Most judges will immediately deny bail if there is any chance of witnesses, family, friends, or the general public being in danger. The last point that we’re going to talk about in today’s blog is one that isn’t related to the crime that was committed necessarily but does take the citizenship of the defendant into consideration. When someone who is not a US citizen has been charged and arrested, they will not be granted bail. If there is no proper documentation for the defendant, Immigration and Customs Enforcement will get involved and will likely place a hold on them. Outcomes in these instances vary greatly depending on the severity of the charges and the circumstances under which this person is in the country. Having a bail to pay isn’t something that everyone has the opportunity of. While it may not be the best case scenario, having a bond to pay is definitely better than the alternative. Unfortunately, the points that we’ve mentioned above do eliminate bail as an option for quite a few people. If you or a loved one has been denied bail, it’s always good to ask the judge or a legal professional about what the circumstances of this decision where. In the case that you have not had your bail denied, and you’re in need of help paying it off, contact the team at ASAP Bonding. We provide the Lawrenceville area with quick and reliable services so that you can get your loved one out of a tight spot. Reach out to us if you have any questions or inquiries that we can assist with.